I thought I would share a little information about how I setup my NFT (Nutrient Film Technology) systems for growing my cucumbers and tomatoes this year, It’s a few weeks since I’ve done this so you can see how the plants are getting on at the bottom of the post. I use two sets of channels each year, One for the cucumbers and one for the tomatoes. 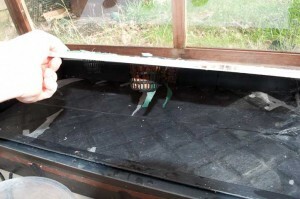 The tanks themselves consist of a bottom tank made of plastic, Which then has the channel where the nutrient flows layed on top of the tank. The nutrient is pumped from underneath into the top channel and then flows down the channel where it re-enters the bottom tank. Unlike using a nutrient method with lot’s of pipes there is very little risk of leaks using this method as it’s all self contained. As you can probably see in this picture I’ve already got the nutrient being pumped into the channel ready for the plants, I do this so that the system has a day or two for the nutrient solution to properly mix and settle. So I can take a proper reading of the pH level and the nutrient concentration level. These are probably the most important things in hydroponic growing so I check these and adjust them regurlary. After growing for a few years you seem to get a feeling of how the nutrients and pH levels increase or decrease when the plants are using more or the nutrient’s need changing. 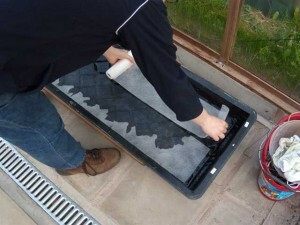 The photo shows me laying the spreader mat into the nutrient channel. 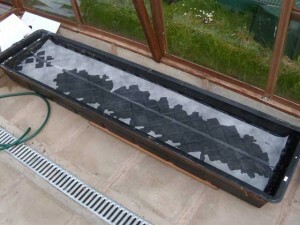 This matting helps spread the nutrients evenly over the channel and also possibly gives the plant roots something to grab onto while they are growing. After the plants have finishing growing the for season this whole mat is about 1 inch thick with roots. This is the third Hydroponic system I’ve setup this year for growing Strawberries, This time I attempted to grow them in a NFT system. 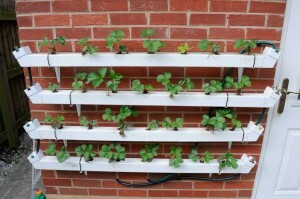 I understand from reading other peoples articles and information on the web that NFT was not the ideal hydroponic method for growing strawberries but I thought I would give it another try. As you can see if you have a read half way down this previous post Our new Cedar Alton Greenhouse – 2007 I have previous attempted this, with unsuccessful results. Anyway, The plan this time was to start the tank with the nutrient solution pumping around the system and be stable. 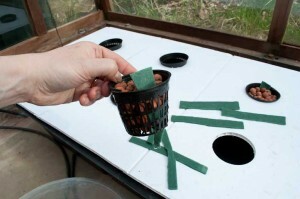 Then to make holes in the plastic cover sheet and place pots with clay pebbles in like the other systems. I did this for a day to see what happens, And surprise surprise the clay pebbles were completely dry . I’m not quite sure why I thought that the nutrients would be able to jump from thin flow of nutrient solution being pumped around into the clay pebbles. If there was a lot more of a flow maybe this would have helped but the nutrient pumps do not create that amount of flow. I then had the bright idea of using some capillary matting to try and get the nutrients to be wicked up into the clay pebbles, I placed two wicks made up of matting into each pot filled with clay pebbles. 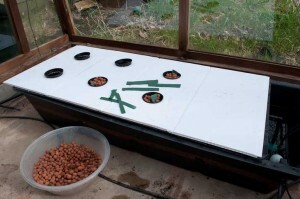 I thought perhaps the nutrients would be taken up enough to be able to keep the clay pebbles full of nutrients. After setting this up I placed one strawberry plant in one of the pot’s and left the system running for a couple of days. When I came back the pebbles were bone dry and the strawberry runner was not showing any sign of being alive. It appears like the clay pebbles either need to be submerged within the nutrient solution to soak it up or drip fed from above, I may try the drip feeding method from above next year. For now though I have decided to abandon this method of growing as it seems unreliable at best. At least I have tested one of my tanks and have a NFT system ready for running and growing the tomato plants later on in the season, These I know from experience are more than happy to be placed directly within the nutrient solution.